A Gino Night on Wednesday followed by the biggest win of the young season on Friday night. It took a month, but the 2018-19 Boston Celtics have finally arrived. Kawhi Leonard and the 12-3 Toronto Raptors came into the Garden and gave the C’s everything they had, only to be outlasted 123-116 in overtime behind an incredible performance from Kyrie Irving. 43 points, 11 assists. He dropped 19 in the fourth quarter and four more in overtime. After scoring only two points in the first half, Jayson Tatum poured in 19 in the second half and overtime to finish with 21 and seven boards. Kyrie and Tatum combined for 42 points in the second half and OT. Gordon Hayward led the team in minutes (39), plus-minus (+18), and steals (4). He was 4-for-8 from the field and a perfect 6-for-6 from the free-throw line including the two that tied the game with 24 seconds left in regulation. 15 points (4 in OT), 5 assists, 5 rebounds. His best game as a Celtic thus far. Al Horford once again narrowly missed a double-double with 11 points, 9 boards, and 2 blocked shots. Marcus Morris had 11 points and 7 boards. 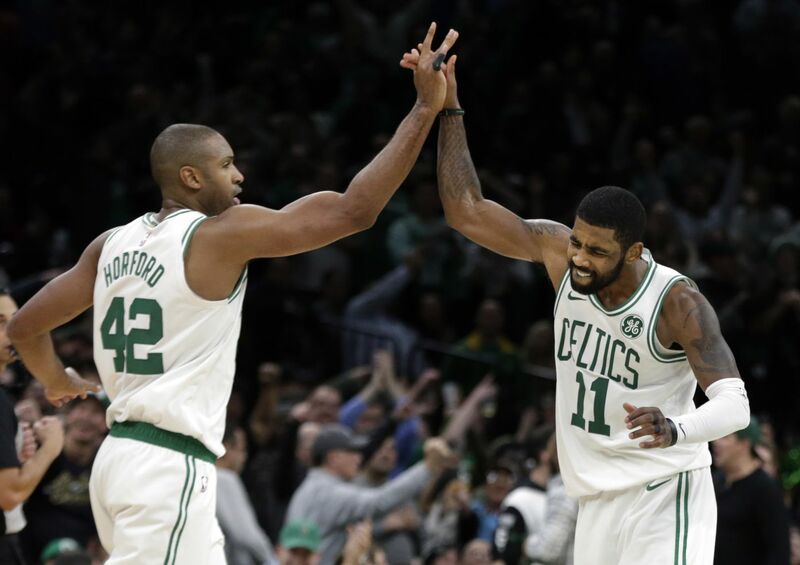 This was as important a win as you can have in mid-November, and it could be the start to a streak that Celtics fans have been desperately waiting for during this somewhat disappointing first month. Boston’s next 15 games are against mediocre opponents. Over that month-long span, the Pelicans (8-7) and the Pistons (7-6) are the only two teams they’ll face that are currently above .500. Their next legitimate test will be on December 21st against the Bucks. They should at least go 12-3 before then. Don’t be surprised if they rip off anywhere from 8 to 15 wins in a row. The Celtics found their groove when they ran the Bulls off the floor on Wednesday, and then they proved that it wasn’t a fluke. A 9-6 start wasn’t what most people envisioned, but there’s a good chance they’ll be first or second in the East by Christmas. They’ll look to win their third in a row on Saturday night at the Garden as the Jazz come into town. Tip-off at 7:30.